In the strict sense not a whimsey, but still an extraordinary piece. 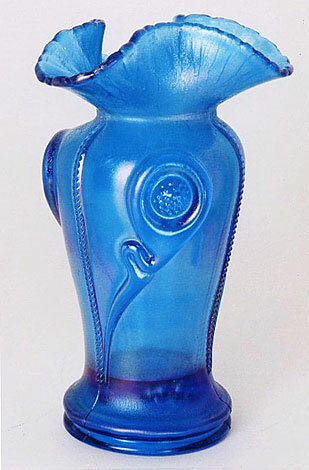 It's a Tree Trunk midsize vase that was made of a swirled blue glass called sorbini. The only one known. 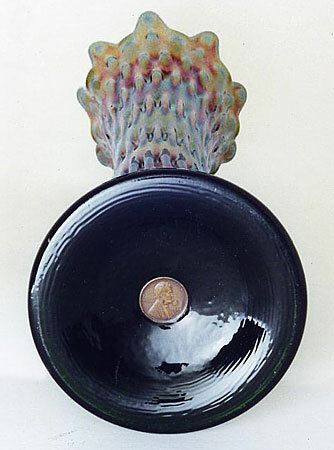 Another unusual vase, this one a standard Rustic but with a penny molded into the base. Presumeably the glass maker dropped the 1909 penny into the mold before pouring the glass. To see a similar example, click, here. This is an odd piece. 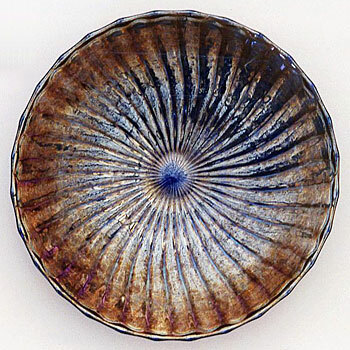 It's a small plate whimsied out from a Fenton blue Persian Medallion rosebowl mold. Above is the back, which has the Persian Medallion pattern. 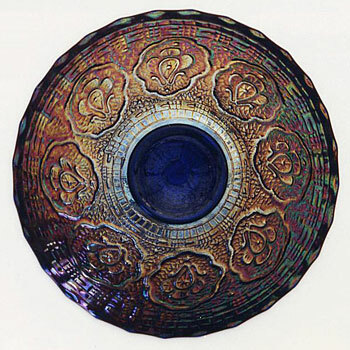 This is the front of the Persian Medallion small plate from the blue rosebowl. Interesting because we never get to see the interior pattern of the rosebowl. Another ladies' spittoon, this time a Fenton Feathered Serpent in green. Probably from the sauce. 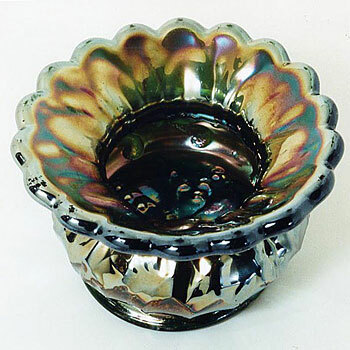 This time it's a Millersburg piece, a ladies' spittoon made from an amethyst Grape Wreath sauce. 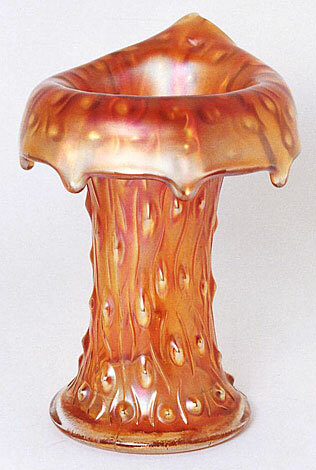 The top shaping to this Northwood Tree Trunk vase is called Jester's Cap--as opposed to Jack-in-the-Pulpit. Sometimes seen applied to Northwood's Thin Rib vases and rarely to their Tree Trunk vases. 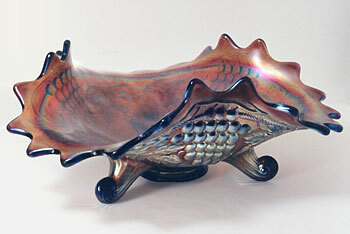 Both an unusual shaping and a rare color on this Northwood Tornado vase. 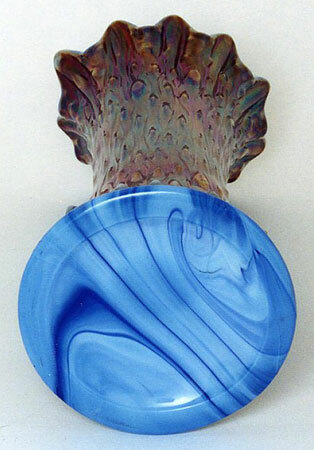 It's pinched in like a spittoon with beautiful ruffling and is in celeste blue (or sapphire, as some collectors call it). No others like it. Dugan made very few whimsies, but here is one. 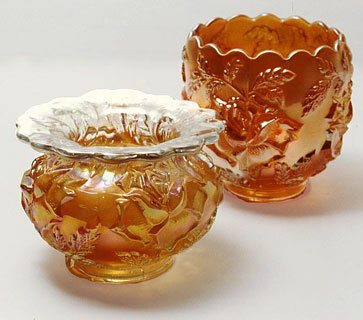 It's a marigold ladies' spittoon from the same mold used to make the common rosebowl (in back). This one is marigold and there is one known in lavender. 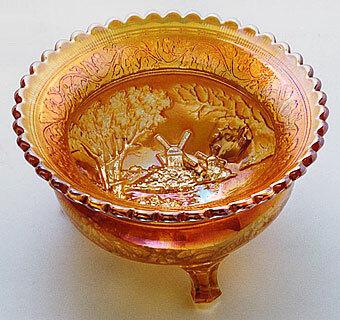 Imperial also made relatively few whimsies, which is why this marigold spittoon formed from a Windmill bowl is so rare. Only one known to my knowledge. 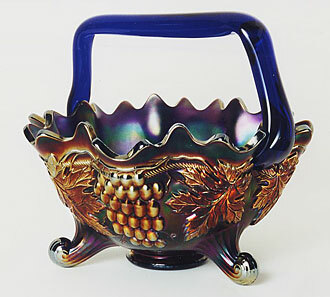 A Fenton blue Grape and Cable fruit bowl (with plain interior) has had a handle attached to make it a unique basket. 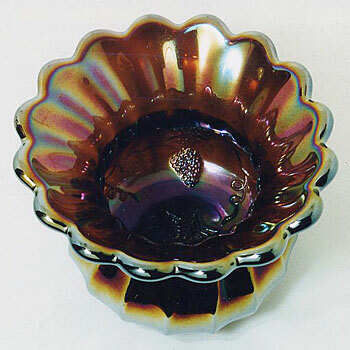 Another Fenton Grape and Cable fruit bowl has been opened out into a tricorner whimsey. I know of a couple of these, but still quite rare.